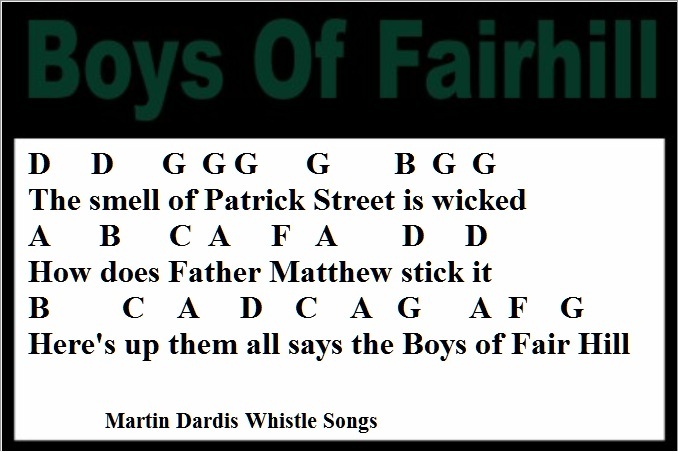 The Boys Of Fair Hill lyrics and guitar chords-A traditional Irish song from Co.Cork.Made Famous by Jimmy Crowley. The Wolfe Tones also recorded it but with different lyrics, The tin whistle notes are included. [G]Come, boys, and you'll see[Am] lads and lassies[D] full of glee. [G]Famous for[D] all they will[C] make your heart[D] thrill. The[G] boys they won't harm you and the[Am] girls they will[D] charm you. [G]Here's up 'em[D] all, says the[C] boys[D] of Fair[G] Hill. Come, boys, spend a day with our Harrier Club today. The cry of the hounds it will make your heart thrill. And when you hear Conny Doyle say "the Armoured Car has won the day,"
Here's up 'em all say the boys of Fair Hill. Which can be seen from the groves of Fair Hill. Where round us in gallons the porter does flow. First they tap a half-tierce and drink a health to Dashwodd's race. That's the stuff to give them, says the boys of Fair Hill. 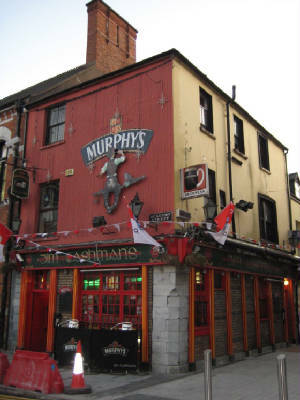 Come, boys, and spend a day with our hurling club so gay. The clash of the ash it will make your heart thrill.